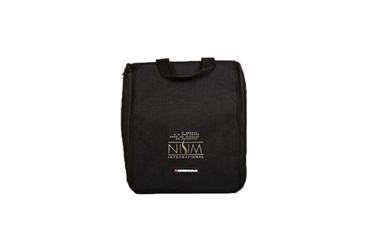 The bag is made of rugged steel colored nylon. It is designed for instant set up. Just hang it on a door or towel rack. No need to unpack. The spacious zippered main compartment has 6 divided mesh pockets ideal for full size bottles. (Ideal for Nisim Hair Products.) There are 2 interior zippered pockets one mesh and one water resistant PVC, these are ideal for smaller grooming aids. The bag also has 6 elasticized holders for combs and brushes etc. Easy to use wipe clean lining. The toiletry bag is made of a very nice material. It seems very sturdy and it was really nice to gift the pack in this nice bag along with it.